Thanks to all who replied re: my issue of Genesis and other objects looking funny and blocky... I've been trying to get back to the thread... ok it took me A LONG TIME to find the "Tool Settings" dialog box, which for me *under Windows Vista* looks a lot different: under "Draw Style" I only have "Bounding Box & Surface" or "Bounding Box Only" as my choices and it's displayed a bit differently than the screen shot that Szark provided. There's nothing anywhere that looks like a Manipulator "Off" switch. Since my first post I've downloaded one of the betas, 135 or 137 IIRC, and DAZ Studio is at least not crashing outright, which is what it was doing for most of the summer. To get Poser Debut to sort of work I have been physically dragging .CR2 and .PPZ or .PP2 files into the workspace (I believe those are the ones) and that's helped. Other computers are working a bit better but one has unrelated issues in the Preview window. This problem, and others like it, may be unconnected with the selected drawing style. 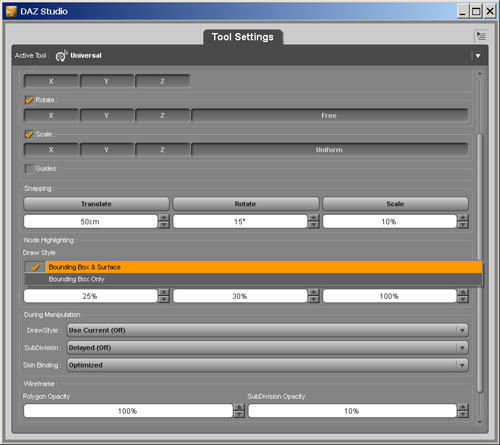 Studio will display grey bounding boxes rather than the model and texture if it cannot find the appropriate texture (or model?). Have you moved any texture files that would account for Studio being unable to find textures? The problem will also occur if you have a content library in the middle of the list of libraries which is no longer present, it appears Studio will not search content libraries past a library it cannot find when loading a .duf file, so you can create a scene, save it off and find it will load with grey bounding boxes as the content library tab will happily access libraries that loading a saved scene won't (I need to raise a problem report on this). No, this (blocky figures problem) began recently and suddenly on a fresh install of DS beta 114, I believe it was - I don't think I moved anything. Although I am a texture-customizing kind of guy It's doing it on a freshly loaded "stock" Genesis without any textures, on a fresh install, and I saw it happen on a Predatron LoRez Dogs scene that I made - the dog figure degenerated into blocks. Sorry to drag things out, but for what it's worth the problem with the blocks appears to have carried over to beta 137. This (offending) computer has run some fairly heavy-duty graphics programs without issue - Sims3, Atari Test Drive (a car simulation), Combat Flight Simulator, Blu-Ray movies etc. No question though that I have all kinds of mis-matched and misplaced content paths for Daz Studio: early on I fell into the trap of not leaving things alone and trying to run DS in a "custom" directory tree and there's some things I haven't been able to shake. When (during the troubleshooting process) I set up DS on a fresh computer WITHOUT mucking around with it, and just leaving everything to run "stock" things were much better. I guess I'm looking forward to wiping the drive on the offending computer, and starting with a fresh install of Win7, instead of Vista 64-bit. This part sort of sounds plausible. Also I wanted to mention that ".duf" was a big surprise for me - previously (early summer 2012) when you saved a scene it was a ".daz" file that was written to disk. For some reason all of my DAZ Studio re-installs, under Vista 64-bit, are picking up on past troubles -- directory paths and such -- but again, Genesis started to do the blocks thing quite suddenly, and the problem carried over from one beta to another. I don't think I had the blocks problem before the betas... the reason I tried one of the betas though, a couple of weeks ago was because DS had completely stopped running, on the Vista 64-bit computer. I thought a re-install might help and for a brief time (a few days) it did... then the blocks started with the advent of the beta (114?) and they've carried over to beta 135 or 137. Is anyone else having trouble getting this beta version and the Essentials 1.4 to download? I had no problems with the release version as far as downloading but I never installed it because of issues with area lights, etc. So I decided I'd try this beta version because it sounds like most issues that I was concerned with have been resolved. But I just can't get a complete download. The downloads end after anywhere from 1mb to >100mb. Sometimes it just stops with an error and sometimes it says it's finished but the file is incomplete and broken. The closest to done so far is 148mb for the DazStudio zip file. I have already reset my downloads 3 times so I suppose I will have to contact support to get the limit raised. Maybe my connection is just bad today for whatever reason. Downloading in Firefox native download manager seems to be worse than using Free Download Manager/Flash Got. The download manager method seems to be slightly more tolerant of faults or something and I got over 100mb a few times. In Firefox the most I managed to download was about 40mb. I finally managed to get the DAZStudio_4.5.0.137_Win64_Bundle.zip to download after a whole lot of tries and 5 resets. I got the Essentials up to 183mb once but still no joy. The last time I tried it got to 12mb and quit and the whole Daz site was down when I went to try it again. So it looks like the problem is on the Daz end. Lots of error messages trying to access the site today. The site seems to have had a problem some hours ago (being in a different timezone means I know only because of messages here). It works allright for me now. From what I can tell the Daz site was not "down for maintenance". They seem to be having problems with their servers/hosting/cdn. The majority of people are having few problems with download but there does seem to be a few users having trouble downloading. My dsl is quite slow and it takes me about 70 minutes to download the 419mb of 14812_GenesisStarterEssentials_1.4_trx.exe at 100KB/s. (419mb is the size of the1.3 version) I am on my 7th reset now and still have not got a complete download. The record so far has been 400mb. The shortest was about 4mb I think. That happened when I clicked to try the 4th download of 5 from the latest (9th?) reset. I normally get "has expired" but occasionally I get the "doesn't exist" as well. I've been finding the download speeds fluctuating quite a bit. From very decent, to ridiculously slow. edit. btw, the use of a download helper will get those 'link has expired' messages happening real fast. Some of them work by trying to use every available port [or whatever] to get the download. And they don't always succeed at that! Yeah I figured out eventually that it was trying to resume the download which Daz, in their infinite wisdom, has chosen not to support. Seems like the stupid site software is counting those resume attempts as download attempts, even though it isn't actually sending anything. I turned the resuming off and the 'chunking' or whatever you want to call it was already off. But the only difference it makes is that I have to reset the download slightly less often. I'm alternating attempts with straight Firefox and with the download manager. Generally Firefox fails a bit quicker but neither one has gotten me a completed download yet. I've downloaded bigger files from other servers just to check my connection and they have finished downloading. Slow but steady. From Daz I still get the occasional "Requested link doesn’t exist" message so I guess their is some weird little problem between me and their servers. I wonder if the DAZ site problems are still going on. I've downloaded .137 three times since yesterday and each time I load the .zip file I get this error message. Think it's a site problem, file problem or I'm I missing something? I lost almost all my download permissions while attempting to download a purchase and now that purchase doesn't show up in the itemized list so I can ask for a reset. I'm guessing I should call them Monday and verbally request a reset. Does this work? WARNING: interface\dialogs\dzbasicdialog.cpp(164): No parent specified for DzBasicDialog! Compile failed on OpenGL Default Material Shaders, rendering without GLSL. I tried it with DS 4.0.3.47 and did not have any problems. As far as I can tell I'm up to date on display drivers so it may be a bug. I haven't read through all of this thread so bear with me but I'm wondering if there are others with the same problem or if they are working on it. Thank's in advance my friends. The nvogl32.dll is an Nvida module so something needs to be addressed there, I also loaded and tried Firery Scene 2 and got the same crash. I reset the 3D setting for DS 4.5 in the Nvidia control panel and it still crashes. After reading threads I saw where some shaders may be a problem which is why I loaded the new ready to render scene and am still having problems. Yes AFAIK, it used to. Either calling or putting in a support ticket, calling being the faster way to get a solution if there's one to be had. Looks like a failed download. There are a couple of other websites where this would happen also when the servers were way too busy. Are you using the built-in Mac unarchiver or a 3rd-party tool? I recall hearing there was a problem with the built-in one. I have purchased a few items during the PA sale over the last couple of days and also updated/reset a few items for download. Almost every single item had a glitch. Either there was a network error message, or the download stopped before it was fully downloaded, or it downloaded but could not be installed. A couple of times, Norton Anti-Virus deleted the items so I disabled it - also without any success most of the time. I reset almost all the items, and had some of the problems repeated, but with enough resets, I've been able to install all the items I purchased or updated. I came to the conclusion that it was just a matter of "being lucky" and that the problems probably are due to the heavy traffic with the PA sale going on right now. You just have to sneak in there when there is a lull in the activities (as for when that occurs, anyone's guess). I thus decided to wait with any updating/resetting until the PA sale is over. Patience - thanks I'll give it a day or two and try again. Mike - I'm using Unarchiver, which successfully opened the new Genesis Essentials which I downloaded last night. If it fails again I'll post a bug - but where does one report download problems? In the Bugtracker switch the Project to "Web Search". Your mileage may vary but I'm still having problems with downloads. Judging by the size of the incomplete downloads the problem actually seems to be getting worse. Yesterday and today I have only gotten over 100mb downloaded once before it glitches. Friday/Saturday I got over 300mb a few times and once got to 400mb. I managed to get the main x64 zip to download the other day and since then I have managed to download a couple of smaller files. But I still have not managed to download the Genesis Essentials 1.4 exe file. I've lost track of the number of times I have tried downloading and the number of resets for the beta that I have done. I've tried download manager, no download manager, Firefox, Chrome and even Internet Explorer. The average amount downloaded is about 40mb out of the 400+ needed for a complete download. You have a 64 bit system so are you using 32 or 64 bit D|S? If you are using a 64bit version then a 32 bit dll seems strange. If you are using the 32 bit version of D|S try the 64. And it never hurts to update your video card drivers whether you think they are up to date or not. I have a superfast internet connection, and I'm getting the same problem! Tried to download the Winx64 zip multiple times at two different locations (Mom's house and my apt) onto two different computers, and the downloads always "finished" having only gotten a partial file (how much was different every time). Same problem trying to get the Genesis Essentials 1.4 exe file. Frustrating! That is the latest driver and I use the 32bit 4.5 when getting this error, I also have DAZ Studio3 64 and 32bit installed. As I mentioned when I first ran into thjs problem I Unistalled 4.5 and reinstalled 4(the latest version) and did not have this problem I then reinstalled 4.5 (32bit beta both times) and I'm still having this problem. It also works flawlessly in 3.1. Did you give it a try? I'm wondering if it's just me but it seems funny that it works in all the other versions accept 4.5 and being that it causes a violation error in the Nvidia openGL module is there an instruction that is not correctly written to access this dll. I am getting the download errors too. Different amount downloads before error each time... guess I will wait a couple days and try again... was just wanting to fix the area lights problem so I could use some of the associated products. That is the latest driver and I use the 32bit 4.5 when getting this error, I also have DAZ Studio3 64 and 32bit installed. As I mentioned when I first ran into thjs problem I Unistalled 4.5 and reinstalled 4(the latest version) and did not have this problem I then reinstalled 4.5 (32bit beta both times) and I'm still having this problem. It also works flawlessly in 3.1. Did you give it a try? I'm wondering if it's just me but it seems funny that it works in all the other versions accept 4.5 and being that it causes a violation error in the Nvidia openGL module is there an instruction that is not correctly written to access this dll.I would definitely try using the 64 bit version of D|S just to make sure. With 8 gigs of ram there is really no good reason at all to be using the 32 bit version. I still can't manage to finish downloading the stupid thing to install 4.5 to try it so I can't help you there. You might want to try a bug report and searching the bug tracker. I would definitely try using the 64 bit version of D|S just to make sure. With 8 gigs of ram there is really no good reason at all to be using the 32 bit version. I will check the bug tracker though and if there's anyone else who has had this experience that could chime in it would most appreciated. Thank's for your help there erostew. Not that it will get much better, because the PC sale is about to be started after this.